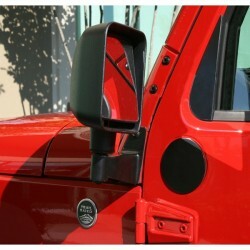 Rugged Ridge Mirror Relocation kit, allows you to use factory mirrors. Remove from Doors, and relocate to windshield bracket. Custom designed brackets bolt into existing holes on the windshield, relocating your mirrors off the door. The perfect add-on accessory for those off-road adventures where you do not want your doors. Each bracket kit for the 2007-12 Wrangler comes with a special paintable filler plate to cover up the hole created when you remove your mirrors. Sold in pairs.